Having my husband home from work. Cioppino from Greg's grandmother's recipe. Thank you to Lulu and Jessica who whipped this up for us on Christmas Eve. The snow. Enough to thoroughly enjoy from the comfort of my living room and not enough to deter any of our plans. Having our family photographed. I love this shot because of what's happening in the picture. 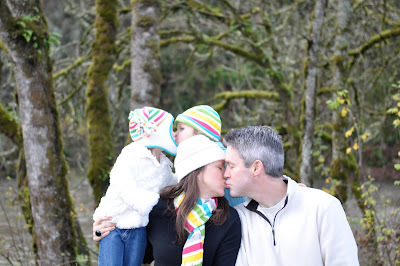 The photographer (my neighbor Kari) told Greg and I to kiss... the girls spontaneously decided to kiss each other too! Very sweet. 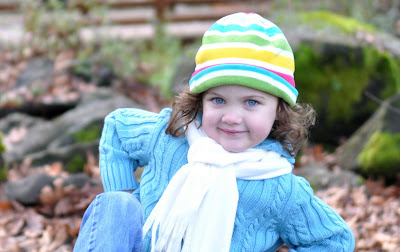 These blue eyes, most especially because her Daddy and I have hazel. Genetics are amazing. While I wouldn't say that I'm a huge country music fan, I cannot get enough of Lady Antebellum's "I Need You Now." This adorable ornament that my friend Simone sent me out of the blue! Thanks Lady! Reading Geneva Magic Tree House books. She loves them and I love her loving them. Such fun. Snapshots that are taken from "above." I'm telling you people, others may wonder who that GIANT was that took the picture of you and your friends, but the payoff is tremendous--super flattering! Tinkerbell and the Lost Treasure movie. We drove to Tahoe and back before Christmas (fabulous trip--another post for that coming up soon) with the ladies. They were champs for surviving the car for as many hours as they did (10 hours the first leg, 2 the next, and 11.5 on the journey home). This delightful cocktail my neighbor Shelly made for our Holiday Progressive party (again, fabulous time... another post on the way...). One ounce triple sec, Spumante champagne and frozen cranberries. As tasty as it is pretty--very sweet. HBO'se True Blood. I knew I would like the series but we've held off getting HBO back (you know, trimming the fat in this recession). We broke down last week and have been enjoying a couple episodes from season one most nights after the girls go to bed. It's pretty graphic, kind of rough around the edges, and I love it. I've read the books and the series is not following the plot lines exactly... but it is living up to the story. Letters from my dad--that he sends to the girls. We call them "Papa Clyde Letters" and they are always a treat! Keep 'em coming Dad! Holiday Cards. I love to see how everyone's kids are growing up and to hear what everyone's been up to. I love looking through the cards over and over. I miss our family and friends and these little "hello's" are a treat! Seeing Piper thoroughly enjoy her great-grandpa. Whenever she talks to my mom now she always asks her about "her dad." We invited Nana here in January... on the phone Piper said, "Yea Nana... Bring your dad!" Awesome. My fresh wreath. Do you think it would be weird if I left it up until Valentine's Day?